The routine I have for my kitchen is pretty simple and allows me to maintain a nice clean space to prepare meals for my family. Generally we wash dishes once a day, in the evening, except on the weekends when I tend to cook more and bake. We each have our own "dish days" and as long as we follow the routine our kitchen is always clean. When we come home at the end of the day I'll start a sink of hot soapy water and we'll wash any dishes used to prepare our breakfast and lunch in the morning, plus our lunch containers. Then I'll start dinner and I wash as I go. Then I drain and rinse the sink. 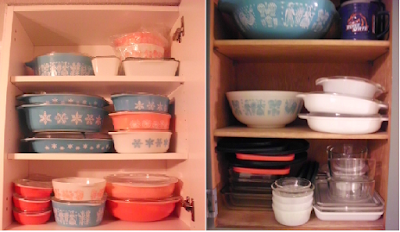 My collection of vintage Pyrex - perfect for leftovers! After we eat we all work together to put away leftovers, clear the table and then whoever is responsible for dishes rinses everything and starts a fresh sink of soapy water. 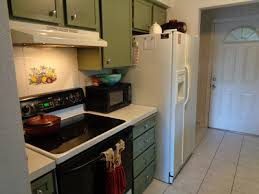 The dish drainer is emptied, the dirty dishes are washed, the counters are all wiped down along with the stove top, microwave, dining room table and the handles to the refrigerator. Any food that hit the floor is also cleaned up with a rag and if the trash can is full it gets emptied and a fresh bag is put in the can. The entire routine only takes about 15 minutes. We allow the dishes to air dry. When we do our nightly walkthrough dishes are put away and the dishtowel and cloth are put in the laundry basket to be washed. We get out a fresh towel and cloth every day. I have to admit, I'm a neat freak and I'm constantly tidying up as I move through my home. It's a compulsion I am all too well aware of, but you don't need to be a neat freak to have a clean home or kitchen. Just 15 minutes of concentrated effort everyday is plenty of time to wash your dishes and tidy things up. And if you happen to have a dishwasher (we do but I prefer hand washing) you can probably cut that time in half. This is all that we do and when I combine that with a 15 minute weekly deep cleaning we are pretty much set. Great post today, thank you. I also am a neat freak so I like reading about other people and how they keep things straight. I had a small injury to my wrist last week and had difficulty keeping all the counters and table wiped off, drove me insane until I caught up :). Thanks (long time reader, first time poster). YOu are so organized! My hubby is in charge of cleaning the kitchen and doing the dishes since it literally hurts me to load the dishwasher, empty it and hand wash the pots and pan. I still do most of the cooking an baking, but that is about all I can manage. You and hubby have a great system. I do fine with the top rack but I struggle with the bottom one which is another reason for me to hand wash. That and the fact that I love to put my arthritic hands in the hot water. I have to admit I drop stuff sometimes. Irritates me so much. I try to never go to bed with dirty dishes. Usually they are air drying and get put up while my first cup of coffee is being made the next morning. I have a dishwasher but always forget it's there. With just two people in the house I only use it about once a month just to keep it working. Seems like it takes days to fill it up since I don't do my knives or pots and pans in the dishwasher and we run around saying where is the______ (fill in the blank) until one of us realizes it's waiting in the dishwasher to be washed. I like the peace of knowing all the dishes are clean before I go to bed and ready for anything. I'm a worrier - what if we lose power or the pipes freeze and we haven't run the dishwasher or done the dishes. Then we start with a mess. I'm the same way with laundry. Take care. Me too! Not nice to wake up to a dirty kitchen. Thank you Lee Ann. I love it too! 1. Whoever cooks, does not wash dishes. 2. Someone with young non-arthritic knees gets food out of the freezer in the basement. 3. Tall people (everyone but me and the dog) gets the things out of the top of the cabinet. Everybody does everything If you see something needing to be done, do it. When the kitchen becomes crowded, someone will move to the laundry room and fold clothes, or take out the trash. I suppose you could call it organized chaos. Everyone jumps in and starts working. It also seems to be the time we all connect and share our news.